We understand that safety is your number one concern when it comes to hanging heavy objects. Not only has this hanging kit been thoroughly tested in a controlled environment by a quality control team, but it's also been put to the ultimate test with our own families. It will remain safely and securely in place for many years. The ultimate hanging kit includes everything that you need to safely and securely hang a hammock, hammock chair, porch swing, swinging chair, punching bag, hanging plant, or any other heavy object that you need to mount from overhead. The stainless steel, rust resistant parts allow you to use the kit indoors or outdoors. Mount it to any solid surface such as a pergola, patio, gazebo, veranda, or in your garage, bedroom, rec room, or under a tree in your back yard. Made of heavy duty stainless steel, designed to mounting hammock chairs and other hanging accessories such as punching bags, hanging plants, yoga accessories and so on. 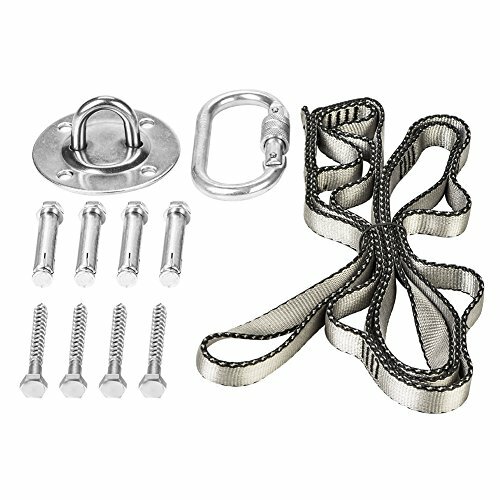 This hammock hanging kit includes 1 stainless steel rhombus pad with ring, 8 stainless screws and 1 spring snap hooks support 1100 lbs, provides the highest quality. Easy to set up - Just drilling four holes for the ceiling mount then install the straps and swivel hook, rotate it 360 degree. When installed on the concrete wall, please use pull explosion screws. Use screws when installed on thw wood beom. DIY your own creative zone - There are 3 ways to install the hanging kit, you can rest assured that whatever you want to hang indoors or outdoors (hammocks, porch swings, heavy bags, hammock swing chairs) for you or your children, it will be safely suspended, ready to offer you moments of fun and relaxation for a long time. 100% SATISFACTION GUARANTEE - This ideal hanging kit and its premium quality components, including ceiling hooks, useful for mounting hammocks and similar other equipment is a must-have for every home. Any problem, please contact us at the first time. We promise to give the customer 100% SATISFACTION GUARANTEE and one year warranty. View More In Hammocks, Stands & Accessories. If you have any questions about this product by Greensen, contact us by completing and submitting the form below. If you are looking for a specif part number, please include it with your message.